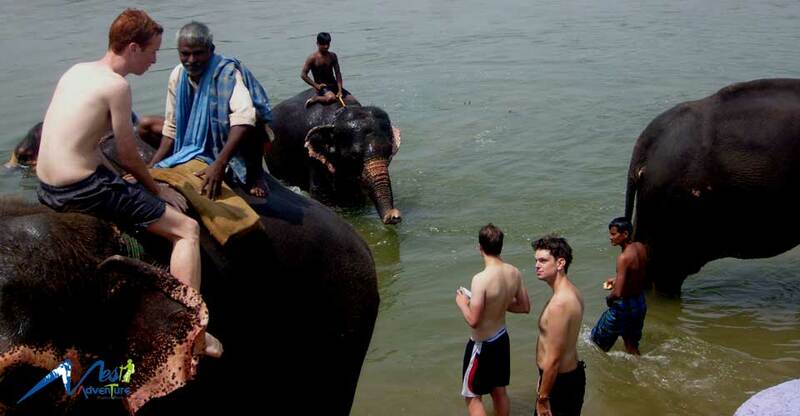 Chitwan Sauraha is famous place for jungle and wildlife activities. Situated at the very low altitude it lays on Terai belt of Nepal which is extremely fertile and flat land. Unlike hilly region there is no any terrace farming it just consist of massive field full of lush vegetation. As Chitwan National Park is situated near Sauraha it provides excellent opportunities to enroll with wild life and vegetation on nature. Unlike Pokhara and Kathmandu there is no night life in Chitwan, street are empty early, no one walk out of their hotels, home because they might encounter with wild animals. -	Tharu Village Walking : Its exploration of typical Tharu an ethnic group on their own settlement in village. One can experience different housing, different culture and different environment throughout the jungle walk. -	Tharu Culture Show : It is cultural performance of same Tharu People where they show different cultural dances, their tradition, typical dresses, fire dance, stick dance, peacock dance and many more. -	Sunset View : One of the amazing parts is sunset over bank of Rapti River, where sun light is very dim and can be observe much closer it looks almost eatable something like orange. 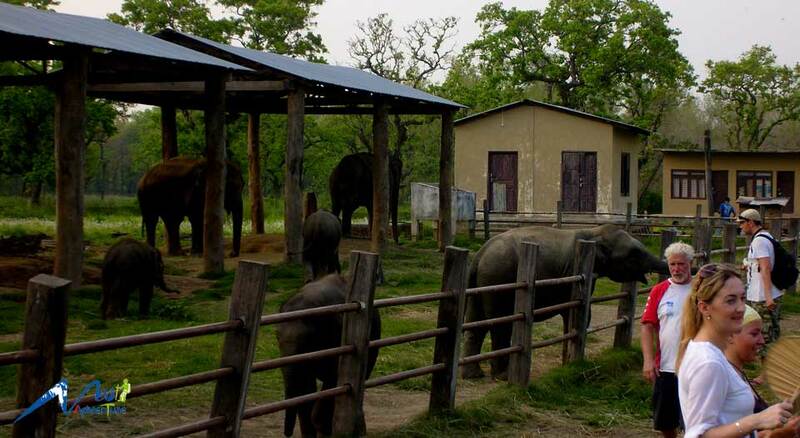 -	Elephant Breeding Center : This is the things which kids will enjoy the most, as this arena is full of elephant with their infants. The most amazing part is care & affection of mother elephant for its small infants. As you go closer they give you their trunk, you can feel them but don’t feed them. -	Canoe Ride + Bird Watching + Jungle Walking : This is three in one package is one the most charming things to attend. Early in the morning after tea/coffee break you will be headed toward canoe, where long and narrow boat are waiting. After that it is like almost around one hour long ride over smooth flow of Rapti River, sometimes we might encounter with crocodile on the way as they can be found laying of bank of river with rising sun. Bird watching is side activities during this canoe ride as one can observe numerous bird, some local some migratory birds on the both bank of river, some flying high with you. 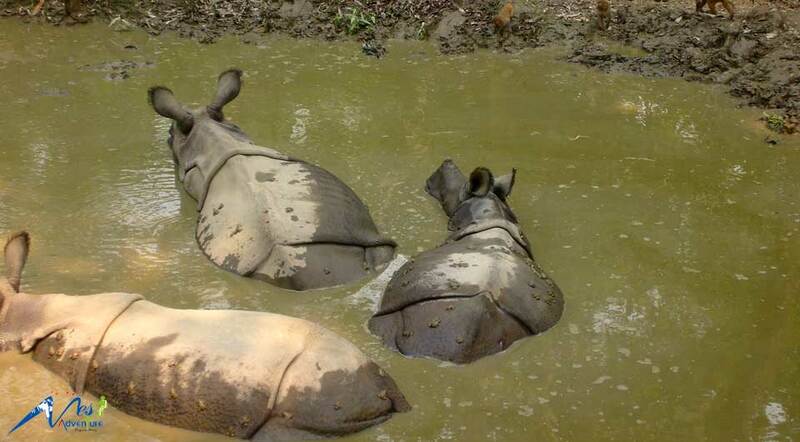 If you are lucky enough rhino can be spotted having fun on river. At last your canoe will be on beach of Rapti from where jungle walking starts. Now our professional nature guide will take you inside the national park. On the trail you can spot rhino, boar, deer, antlers, peacock, snake, if lucky enough tiger on pure wild state where they are free. Just follow the instruction of guide it will be safe and more fun. -	Elephant Back Safari : Instead of fix route this elephant back safari also leads you deep inside the national park, couples of elephant leave at once some goes from this direction, some from that, make a big round try to trap rhino or other animal inside circle of elephant is amazing and bit scary activities. As elephant take you deep inside a jungle, they produce strange sounds, you feel like a Tarzan in Jungle. Just feel free and safe enjoy the nature. -	Jeep Safari : This is another activity with both half day and full day safari option. Which take you deep inside national park with safer ride and increase probability to see Royal Bengal Tiger. Further it takes to crocodile breeding center where one can explore entire breeding area full of crocodile and alligator. Those alligator are released on Rapti River later when they grow up and can survive on their own. The main attraction of Chitwan is packages that we offer and you must buy it, seriously you must buy. Let us make all our valuable blog readers clear that all those activities in Chitwan are possible to so single but it is extremely expensive almost 4 to 5 times expensive. Why is this so?? This question might have arisen on your head now so let us give you in depth information. Normally all those activities are on sharing basis for example if you are about to go for Elephant Back Safari inside the jungle then you need to pay for whole bus of jeep to get to riding spot. Now another thing is one elephant can take maximum four people but if you are alone you need to all four tickets just to ride solo only you as it are term of business for elephant owner. Next example if you going for jungle walk then you need to row on long wooden boat which can hold around eight people again you need to pay for eight tickets, next thing two nature guides are compulsory while walking in jungle you need to pay full salary for guides, clear all national park tax single. I hope now you can imagine how expensive it's going to be. How can I go to Chitwan..? 1. Flight Option – One can attend domestic flight from Kathmandu to Chitwan on small jet which takes around 20 to 25 minutes. The flight is simply awesome with mountain range of right side and low land below. Current official rate of Kathmandu to Chitwan one way flight is US 95 per person. However cost are always negotiable depending upon flow of passengers, stock ticket, time gap of booking as we offer cheaper price then official price of Kathmandu Chitwan. Please inform us as soon as possible to get stock ticket in lower price. 2. Drive Option – Every morning Tourist Coach depart to Chitwan at sharp 7 A.M in morning which took around 6 to 7 hrs to reach Chitwan and regarding the cost it start from US $ 8 to US $ 18 per person for one way transport. Although long it is quite interesting to drive to country side of Nepal. Not only that another option if rent a car, depending on number of people of group suitable car can be hired which is quite comfortable and cozy in compare to bus ride. The price of car from Kathmandu to Chitwan start from US $ 100 one way up to person via sedan or hatchback car.